As part of its ongoing effort to bring the voices and experiences of people living with arthritis to the public, medical and research communities and government, Arthritis Consumer Experts (ACE) recently conducted the JointHealth™ Survey on Arthritis Treatment and Care to find out what readers who live with arthritis need or want in terms of their arthritis treatment and care. This issue of JointHealth™ monthly is devoted to reporting back to readers and getting the important information gathered through the survey out to those caring for, or working on behalf of, people living with arthritis. Not surprisingly, the survey responses mirrored what current academic-based arthritis research is telling us: there are significant gaps in treatment and care for people living with arthritis. From insufficient provincial and territorial government reimbursement for prescriptions medications, lack of information and facilities aimed at promoting arthritis-appropriate exercise programs, to lengthy wait times to see arthritis specialists and undergo surgery. Despite having a "universal health care system", people with arthritis are receiving poorer quality service and fewer treatment options than people living with cancer or HIV and this is having a profoundly negative impact on their disease and quality of life. Similar to other acute or chronic diseases, research in arthritis is conclusive that receiving an early diagnosis is vitally important to slowing or stopping disease progression resulting in joint pain, damage and disability. Current research also confirms that a multi-disciplinary model of arthritis treatment and care produces the best health outcomes or "results" for the person living with the disease. Alarmingly, current models of arthritis treatment and care do not reflect "state of the art" scientific and medical knowledge. When comparing what is known to be the best model of care for people with arthritis to the JointHealth™ Survey on Arthritis Treatment and Care responses, we learn very quickly that respondents to the survey are not getting what they want or need. 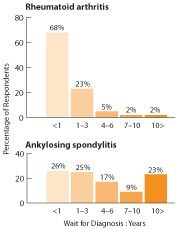 For example, inside this issue you will read that 23 percent of respondents with ankylosing spondylitis—a type of arthritis that affects the spine—waited one to three years to receive a confirmed diagnosis. Given that a delay in diagnosis can lead to permanent joint damage and disability, the health care system must be "re-modeled" to better respond to the need for early diagnoses. To learn more about what people responding to the Survey said, read this month's feature article: The results are in. Public awareness around arthritis issues comes in many forms, be it writing a letter to your MLA urging government to provide coverage of essential arthritis medications or sharing your arthritis story with others in the media. Education around various treatment options and the role of a treatment plan is important for people with arthritis because it increases the likelihood they will adhere to their treatment plan and better manage their arthritis symptoms. Continuing education is also necessary to keep on top of the current treatment and research advancements. Timely access to treatment and care is critical for people living with arthritis. Research shows that delays in accessing appropriate treatment and care can result in higher rates of disability, increased joint damage, increased pain, and significant reduction in quality of life1. Disparities in reimbursement coverage for medications through provincial or territorial health plans or private health insurance. 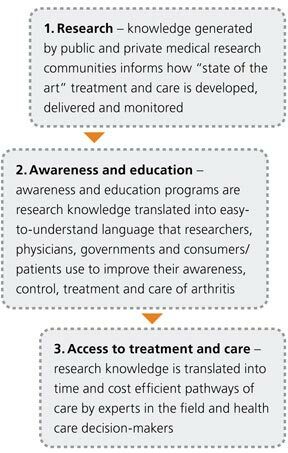 While research provides us with important information on these issues, too often it does not ask people living with arthritis where they feel their care and treatment issues are not being addressed. That is why ACE asked its members and JointHealth™ monthly readers—people living with arthritis—to share their views about arthritis treatment and care. access to specialists, specifically rheumatologists3. The lengthy delays in getting a diagnosis for people living with ankylosing spondylitis and lupus are highly problematic because of the impact on accessing treatment and care. Research has proven that starting treatment for inflammatory arthritis in the early stage of disease onset is the best way to prevent irreversible joint damage. In fact, we now know that there is a small window of time, at the outset of the disease process, when proper treatment can actually prevent joint damage4. 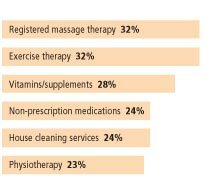 When we look at this data by disease groups, focusing on osteoarthritis, rheumatoid arthritis, ankylosing spondylitis and psoriatic arthritis, we see that with the exception of respondents with ankylosing spondylitis who listed massage therapy as something they need but are not receiving due to cost (31.7%), exercise therapy was the top answer for these respondents. This is an important finding and one that needs to be addressed by policy makers, health care providers and people living with arthritis. As exercise is central to managing arthritis diseases, barriers to exercise—such as cost—need to be removed. In addition to the top five treatments, tools and therapies people reported needing but not receiving due to cost, 19% of respondents indicated not receiving their needed prescription medications due to cost. This is an alarming finding because research has shown that appropriate treatment of certain types of arthritis with prescription medications are one of the most important methods to managing the pain, joint destruction and disability of arthritis7. If you have any questions or comments on these findings, please provide feedback to JointHealth™ monthly at . Arthritis Consumer Experts and ACE Planning and Consulting Inc. encourage the use and dissemination of the information in this document. Please kindly cite the source of the information you or your organization uses from it. Thank you. Ozbek et al., 2003; Feldman et al., 2006; Bernatsky et al. 2006; Suter, et al, 2004; Lacaille et al., 2005.